Husband picked this up at a garage sale also some time ago. you must love him !! Yes, he did well, 3 cups and 1 saucer on this occasion! 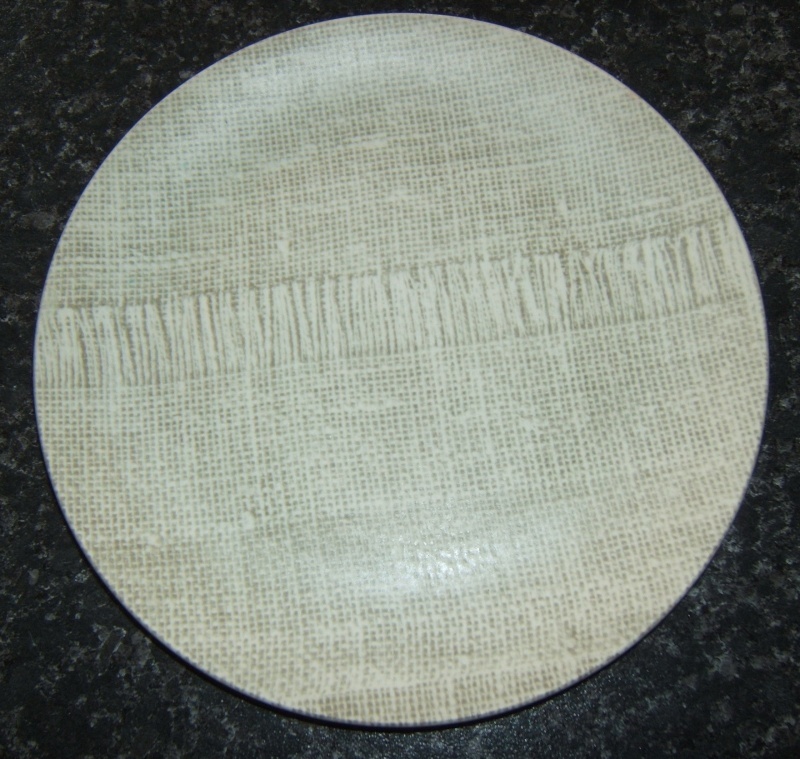 Monterrey plate from Billy Apple's collection in the Crown Lynn: Pottery for the People Exhibition at the Gus Fisher Gallery Auckland. 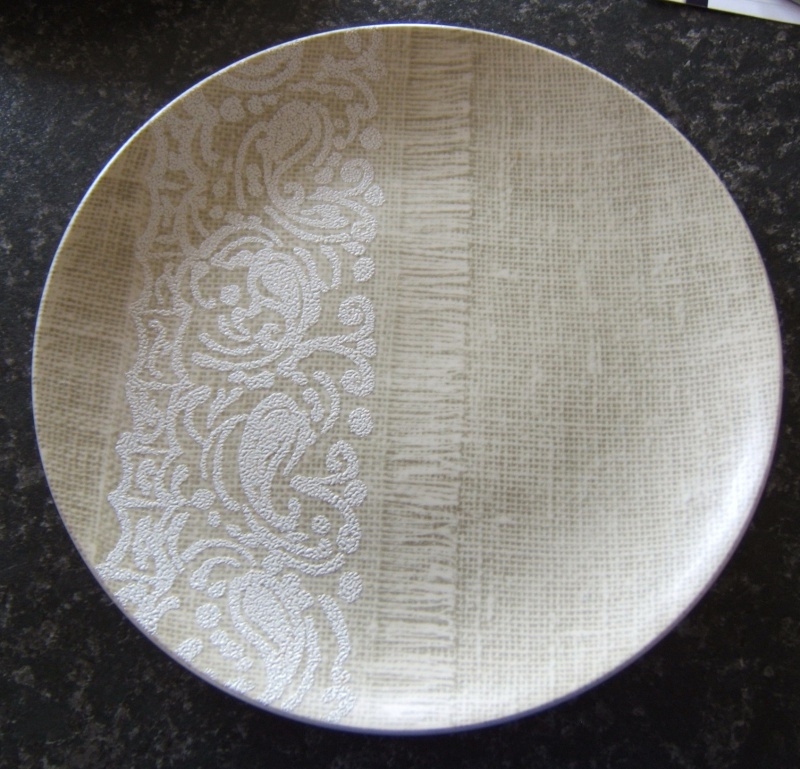 The lunch plate is different from the dinner & B&B & saucer, they all have the white raised pattern on them. 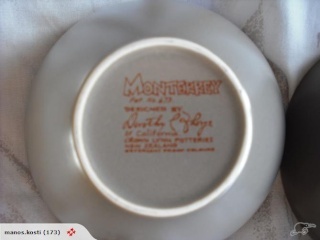 I have a ball handled cup and jug if you need pics of those.Cheers, marl have added a better pic of the Monterrey dinner plate as well Husband says that maybe the lunch plate should have the pattern onit? Who's to know. Where have you been hiding such beautiful pics Marl? I couldn't get a really good shot, but had a go anyway. Will use your pic for the Gallery thanks. Your hubby could be right, as NZ was given a lot of seconds at the expense of export top quality.... ? An amazing story Marl ! I'm going to add your Ball Handled Cup post to this thread to keep it all together. 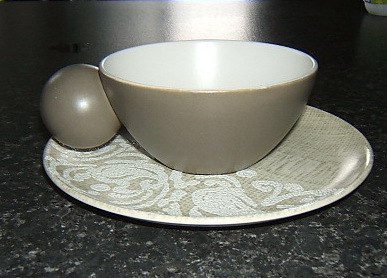 Thanks Ev, sorry, seem to have got the number of saucers wrong! Some Monterrey from my collection. Such a lovely set! Yes it's definitely my favourite Dorothy Thorpe pattern! A sample of Monterrey from my collection. That is spectacular Duckie ! How would your collection compare to Billy Apple's one? Well that's an interesting question Ev. Billy's collection has for a long time been considered the biggest, I would say that's very debatable. 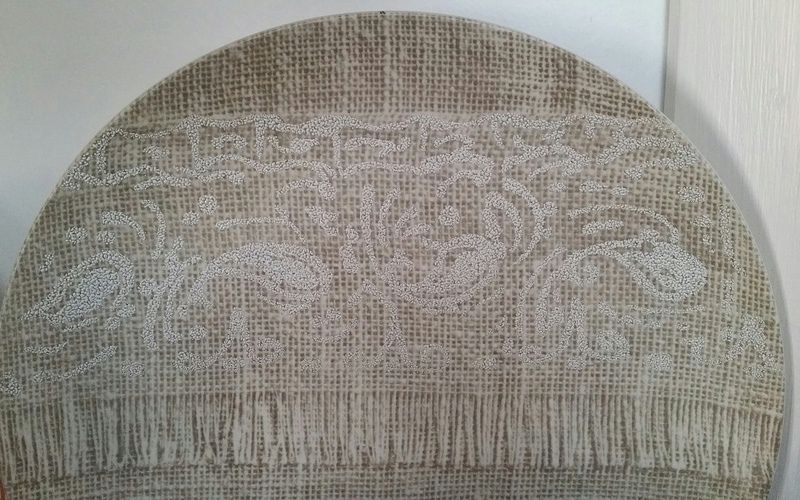 My collection consists of about 350 pieces of Dorothy Thorpe, I have all the patterns but there are a few pieces that have been very elusive. Billy's collection is well known and has been for some time, my collection up until recently has been quite a private collection, I've only disclosed snippets over time, but it must be obvious to you and possibly others that my collection is substantial. Billy gets all of the publicity and is at the Auckland art gallery this month with his dot Thorpe in a 1960's design show. I wonder if such things happen because he has a high profile in the art world? I think you're both correct, a high profile and mates in the right places has earned Billy and his collection exposure, if exposure is what he's been looking for then its worked well for him. It doesn't disturb me that he gets all the attention, he has a fantastic collection that's worth showing off. It does intrigue me a little that people who would consider themselves 'in the know' are naive enough to think there is nothing else out there comparative. I've not really been into publicly exposing my collection, like I've said before its been very much a private collection and whilst I could be encouraged to exhibit in the future, right now I'm very happy keeping it private. 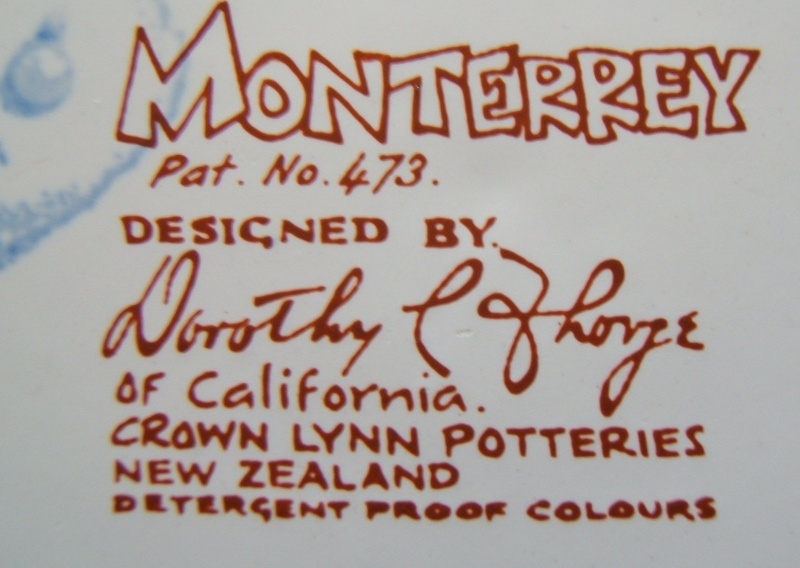 I saw a Monterrey dinner plate today at a Antique store in Cambridge they wanted $125. At the same store they also had a palm springs ball shaped gravy jug but with a oval handle, price $195. 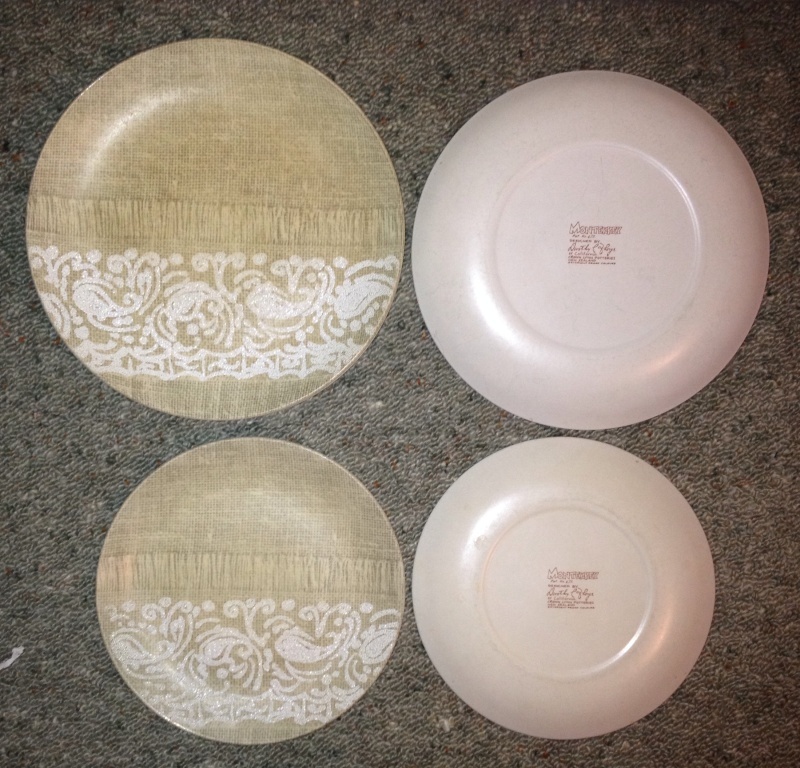 I'm brand new here and have stumbled into the forum as I've just unwrapped a box of "junk" that my parents gave me many years ago to go flatting which includes three Monterrey dinner plates and five (I think) what I'd call bread and butter plates (they don't have the saucer depression). 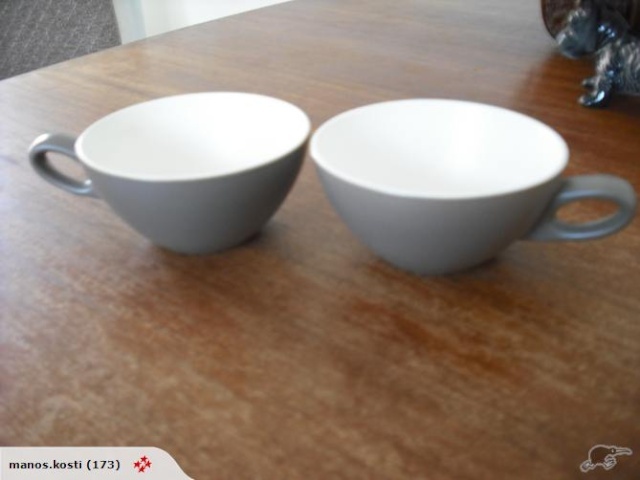 I also have a sneaking suspicion that the salad bowl (in the plain grey/brown) is also in the same collection, although I haven't looked at the bottom to check. The others certainly have the stamp on the bottom and I remember our family using them in the late 70s/early 80s. I also remember mum having some of those cups but they don't seem to have survived. I must admit I have very little use for these, is there much of a market for them? 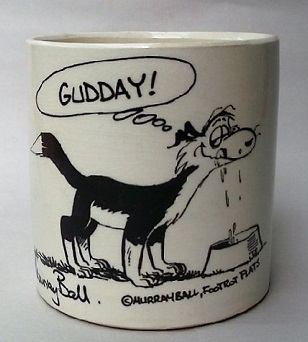 Yes all of the Dorothy Thorpe patterns are collectable, especially the ball handle cups and jugs. 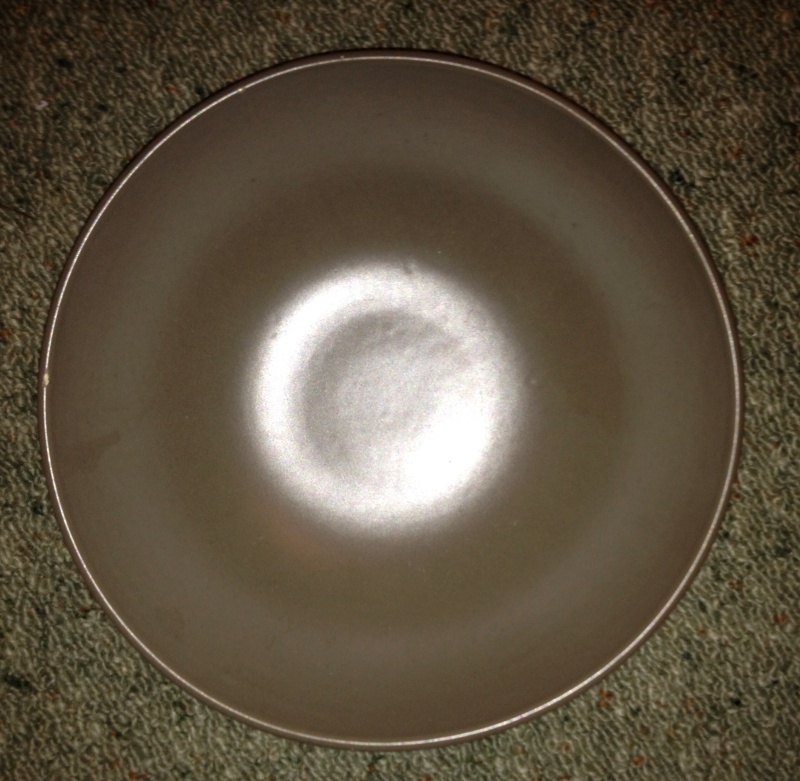 The plates are sought after as well, as you can see from this auction that was on Trade Me recently. Thanks Ev that's very encouraging! It'd be lovely if they did end up with someone who would really appreciate them! I guess I am bragging .... but I was in Melbourne last weekend and wandering around looking at allsorts of collectables, when I caught sight of a dinner plate. I picked it up and said to myself " you have to be kidding 7 buks !!! ?